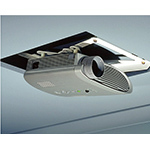 For large installation projectors, mounting is not as simple as climbing a ladder. 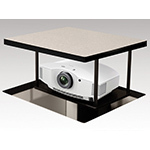 Short throw mounts allow you to install your projector just a few inches from the display surface. 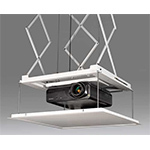 Projector Lift for projectors up to 150lbs. 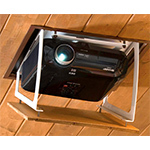 Projector Lift for projectors up to 35lbs. Ingenious design allows the Orbiter to fit in small ceiling cavities. 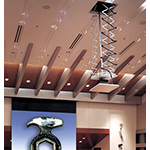 It is the only lift that can be installed in an angled ceiling, or a wall, making it uniquely versatile. 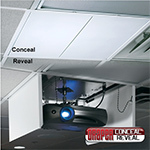 The totally unique Phantom quickly and quietly dips the projector out of the ceiling and into the “show” position at the touch of a switch or wireless transmitter. 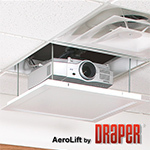 Draper's Scissor Lift not only conceals your projector above the ceiling and sets it exactly where you need it for a presentation, it also brings it down to within easy reach for service.